Have you noticed the occasional spider inside your house? Though most are harmless, they can sometimes be disturbing to have inside the home. Here are a few natural ways to stay spider-free. 1. Clean Up The Clutter – One of the main reasons we find spiders is because we tend to have cluttered areas where they can easily hide. Reduce the clutter and sweep up dust and debris to make these areas less attractive for spiders. Also, remove cobwebs when you see them. 2. Cut Back Vegetation – Keep vegetation trimmed away from the exterior of your home, especially near doors and windows, as they provide good places for spiders to hide. In addition, remove woodpiles and other debris that provide good spaces for spiders to hide. 3. Seal Cracks and Holes – Lock out spiders by sealing cracks and holes in doors, windows and siding. Install weather stripping and secure screens. 4. Adopt a Cat – Cats enjoy chasing, catching and even eating spiders. 5. Use Essential Oils – Make a natural “spider spray” with water and a few drops of essential oil of peppermint, lavender, citronella, or eucalyptus. 6. Use Diatomaceous earth (DE) – Sprinkle it around the perimeter of your home to keep spiders out. DE works on other insects, too. 7. Spray with Vinegar – Fill a spray bottle with a 50-50 mix of water and white vinegar and spray it in cracks, crevices and corners of your homes. It will do a great job of repelling spiders. 8. Try Baking Soda – You can sprinkle it in corners, doorways and windowsills to keep spiders – and other bugs – at bay. 9. Chestnuts – Did you know that the odor of chestnuts really bothers spiders? Poke a few holes in the nut to release the scent more fully, then place them in trouble areas. 10. Turmeric – This fragrant spice is another spider deterrent. Mix two or three tablespoons of pure turmeric powder with water and stir to make a paste. Then apply the paste with a spoon to cardboard and distribute to areas where spiders congregate. 11. 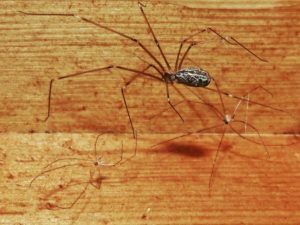 Salt – Common table salt can get rid of spiders. Simply make a saltwater solution and spray it into cracks and crevices often to keep the creatures from entering your home.